OK, so I thought it was time to try something different on the blog here. I know you all obviously LOVE the Disney theme night posts, but I did promise that we would also write about other Disney-related thingamabobs (I got 20…LITTLE MERMAID!! !1111one one) so here we go. I thought it would be neat if the four of us each offered up some of our favorite Disney things in the form of Top 5 lists. According to blog experts (translation: people who dubbed themselves blog experts), people love lists and this will make more people read this thing. So basically, expect a lot of lists. In this version of the Disney Top 5, we will be talking about our top 5 table-service restaurants at Walt Disney World. So please note that this is ONLY TABLE SERVICE. So, a sit-down restaurant with wait staff basically. If possible, I recommend having a turkey leg, Dole Whip or Mickey Bar handy as hunger levels may increase exponentially with every paragraph. Also, let’s go ahead and say each list is in no specific order. We are already writing for you people. You want us to order them too? We have jobs. And school. And soccer. And TV. Give us a break. Also, you may definitely see some overlap here as we are all putting in our own lists and we do occasionally agree. Occasionally. I am going to start and follow up with a post from the rest of the fam. Figuring this out as we go, but I tend to ramble so we figured it might be tough to fit everyone into one post. Oh, and click on each restaurant to be brought to their menu. Techmonologies. I know I said in no particular order but Yachtsman Steakhouse is by far my favorite dinner on Disney property. Located over at the Yacht Club, I love seriously everything about this restaurant. 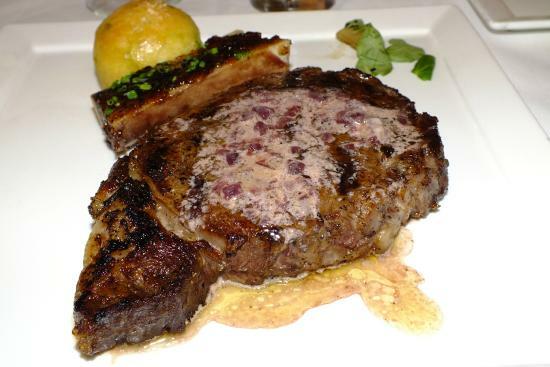 It is hands-down the best steak I have had at Disney (but admittedly I have never been to Shula’s). Last time we ate there I got the Rib-Eye and I highly recommend. Also recommended? Both the lobster bisque and the peekytoe crab-stuffed donuts are like whoa. Oh, also…get an order of both the truffle macaroni and cheese and the creamed spinach for the table. Oh and also I want to go to there now. But beyond the food, there is so much more here to love. The dining area is broken into several small spaces, which combines with its use of natural woods to feel very intimate. The fireplace doesn’t hurt either. In fact, this space is so inviting Owen legit fell asleep on the table last time we were here. And the service has been some of the best I have experienced at Disney. 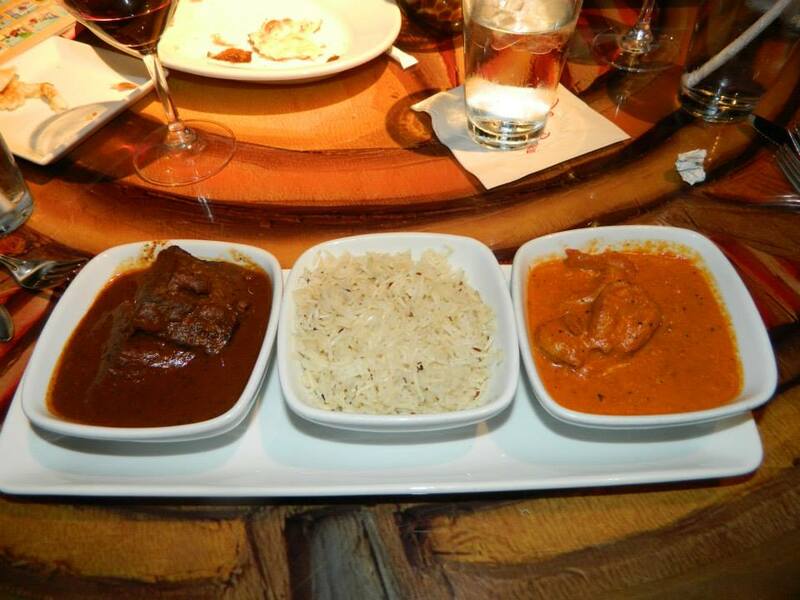 They take care to explain the details of every dish on the menu upon ordering. Which is great. And also hard. On account of it makes everything sound awesome. Steak good. Tip: Before dinner, stop at the Crew Cup Lounge right next door for drinks. Trust me. Or don’t. Whatever. Ah Les Chefs. EPCOT has a number of great choices but Les Chefs is my favorite at the park. I have been to this restaurant on pretty much all of our trips. And I think I pretty much get the same thing every time. And I pretty much always butcher the pronunciation. 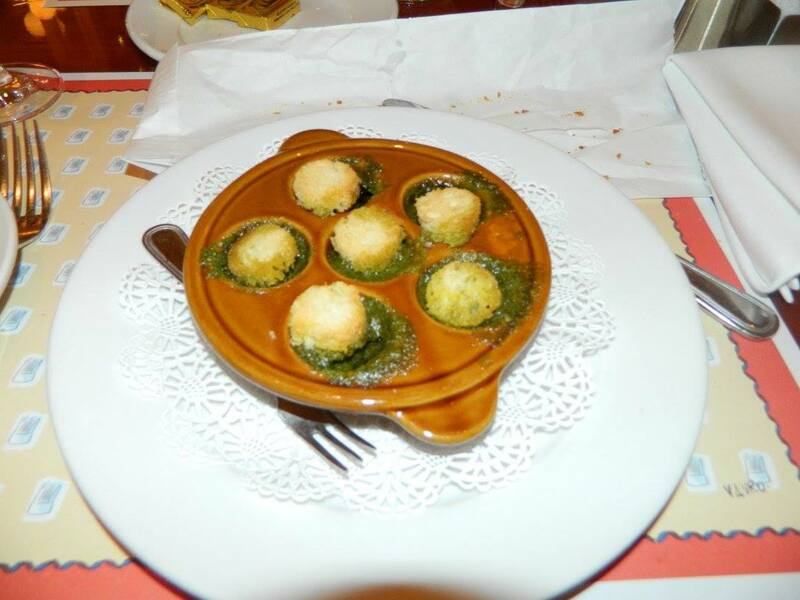 We typically hit Chefs for lunch on one of our World Showcase touring days and I get the Cassolette d’escargots de Bourgogne au beurre persille (snails), Plat de Cote de boeuf au cabernet, polenta (short ribs and polenta) and Profiteroles au chocolat (erm, ice cream and puff pastry?) And of course I get wine. Duh. Its um…French for good. ohai snails. You slow. Now get in my belly. We did used to love when Remy would visit our table, but alas the rat has left the building. The snails are still there though. Sanaa, located over at the Animal Kingdom Lodge’s Kidani Village, has so much to love about it. There is no way to NOT love the atmosphere. I mean, I guess there is a way…but it’s a dumb way. The inside is full of details and intricacies (yeah, intricacies so what) but its really the view that makes it. Floor to ceiling windows here allow you a great view of some of the animals roaming the savannah. Last time we ate here, we got a window seat and had like 24/7 zebra. And the food is quite good as well. The butter chicken? Um yes please. And the naan service? Well let’s just say that since eating here for the first time, my kids are like Naan-heads. 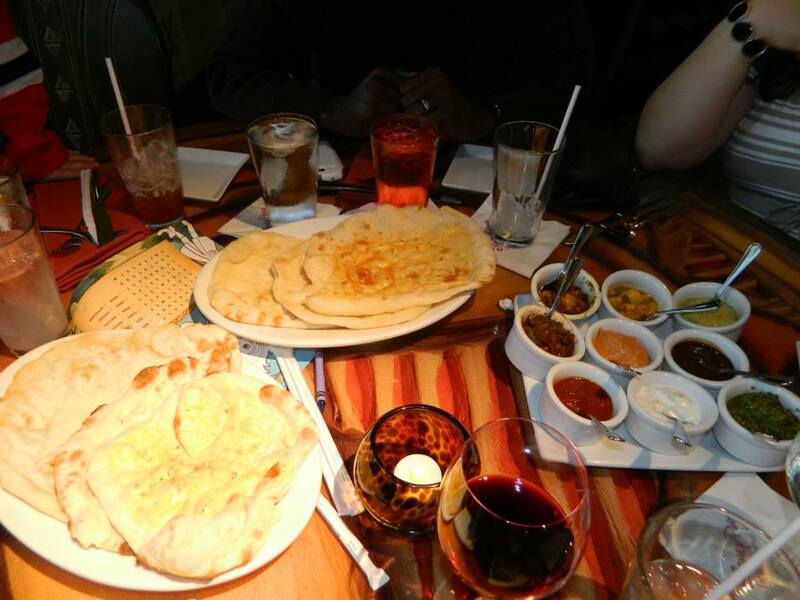 They’re all like, “Can we have some naan?” and I am all like, “ask your mother.” Because I don’t really make many decisions. But I am always hoping she will say yes to naan-related questions. Heh, Owen also fell asleep here. I think he should see a doctor. But Flying Fish is another great place. I think this place is right up there with Yachtsman in terms of service. Last time we ate here, our server was so great. I wish I remembered his name. Kip? Or Ned? Short name. Myles really enjoyed that he kept bringing him Cokes. Hm, maybe he wasn’t so great. Kidding, I kid. But the food is stellar here. The menu changes from time to time but I mean…always go for the Land meets Sea as it offers both beef and seafood. Therefore, you don’t have to choose. Which works out for me. Because I don’t really make many decisions. Pay attention. I struggled with my fifth spot here. I was really between California Grill and ‘Ohana here but went with ‘Ohana mainly because of the memories we have made here. The food is definitely good here, with the bulk of it being served on skewers (though the noodles, chicken wings, dumplings and welcome bread are no slouches, right?) 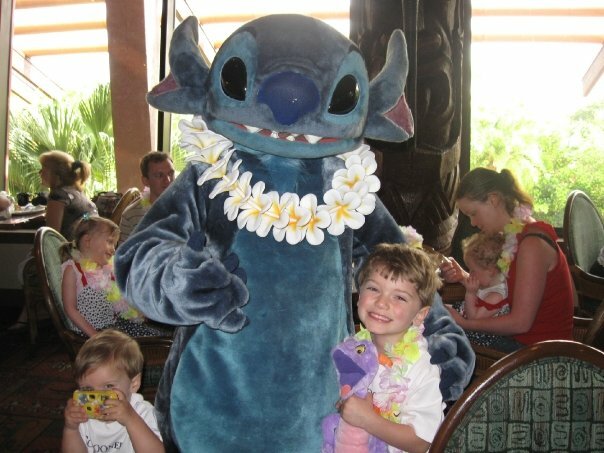 But it’s the whole experience that makes ‘Ohana a place we go pretty much almost every trip. The coconut races and the whole “we are all cousins” vibe of this place always makes it a great experience. As does the bread pudding. As do the Lapu Lapus. 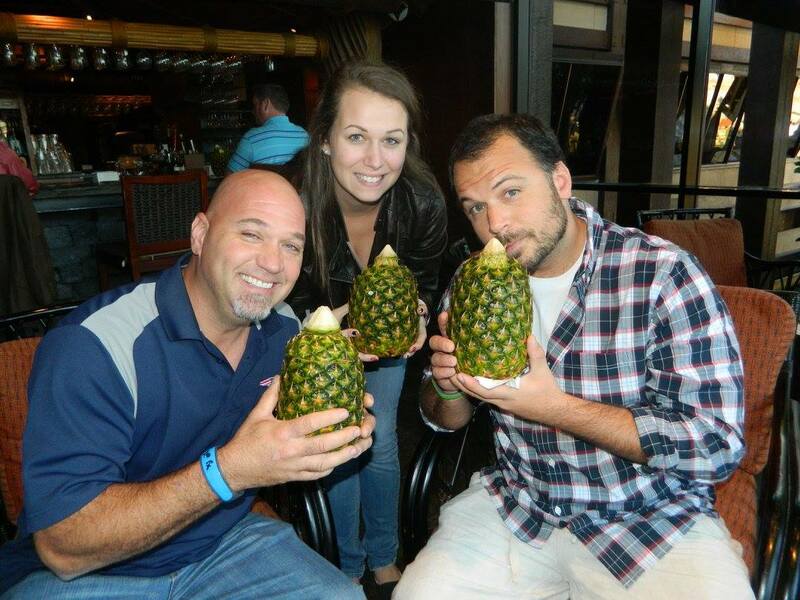 On account of its rum served in a giant pineapple. Hrm, actually it’s a regular-sized pineapple but compared to a glass, its giant. In addition to dinner here, we also do enjoy the breakfast because the only thing better than eating Mickey waffles is eating them with Mickey. And Pluto. And Stitch. And also Lilo. Tip: If you can time it just right, they do pipe in the music from Wishes over at the Magic Kingdom when the fireworks go off.